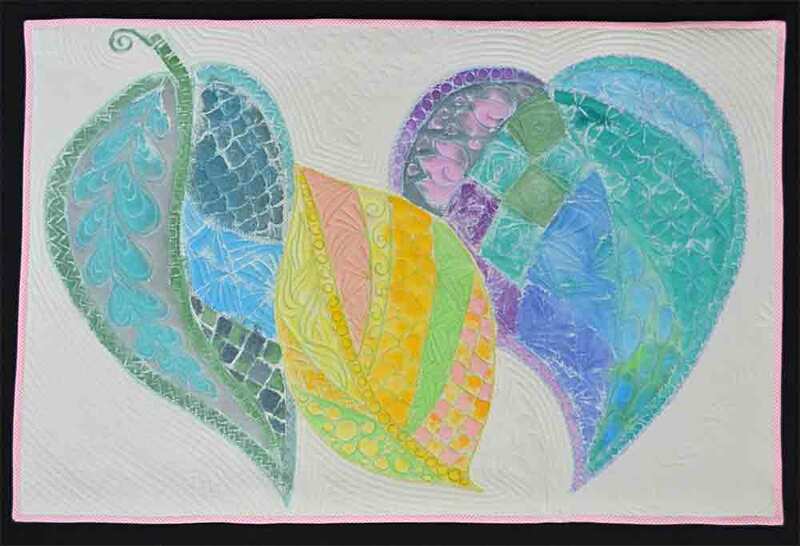 Zentangle® drawing is a great exercise for quilters. It develops facility with infilling spaces, which makes the quilting easier and more successful. 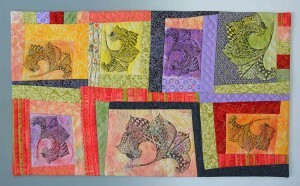 Machine quilting is especially good for the sheer multiplicity of patterns that come from drawing with a pen on paper. 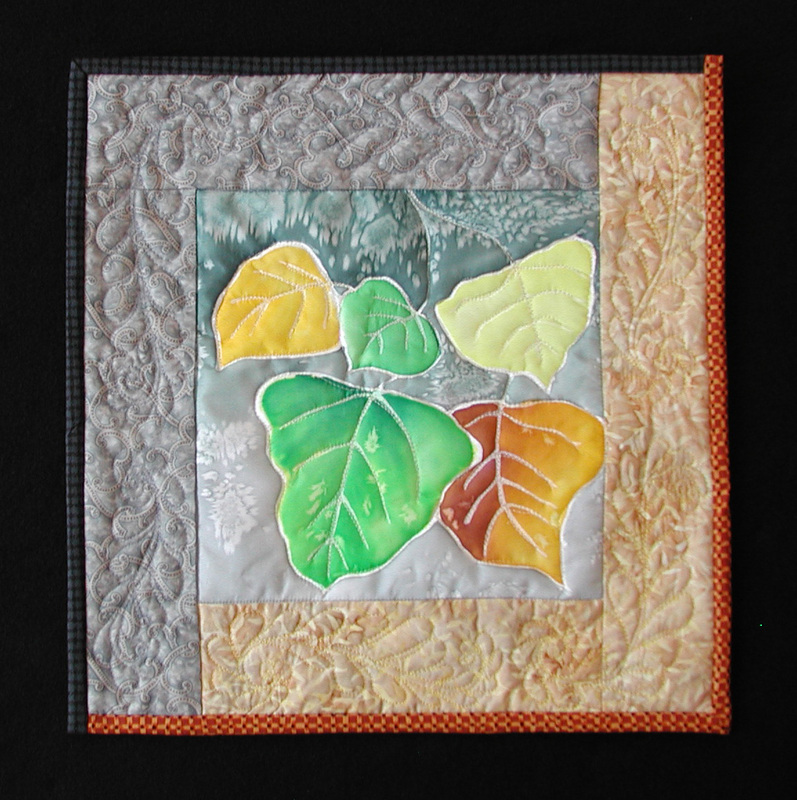 In this quilt, the leaf is an original drawing, re-sized and rotated with Photoshop, then printed on cotton and over-dyed. 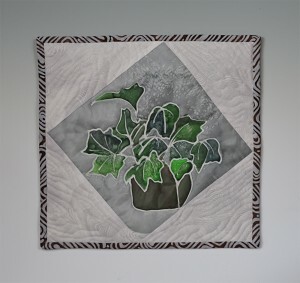 The blocks are irregular to add motion to the leaves, which are rarely stationary in nature. 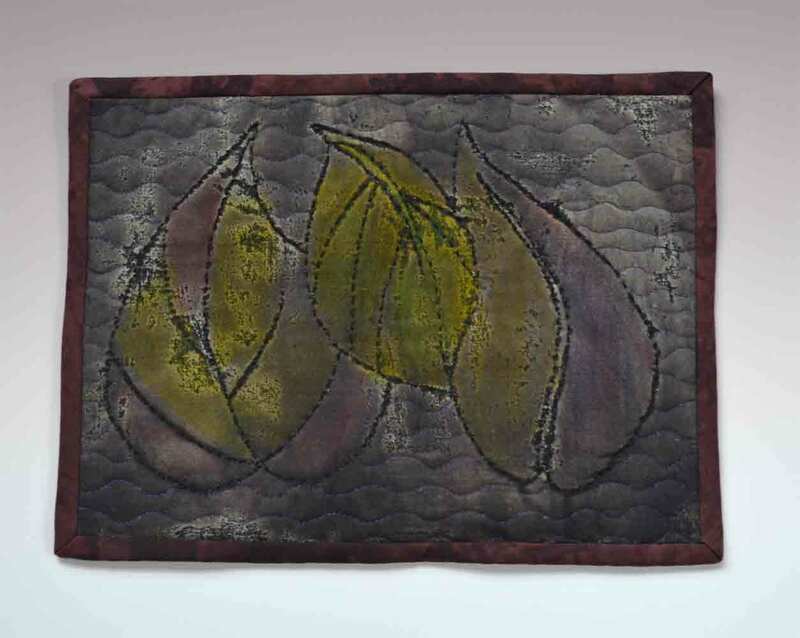 18″ x 30,” it hangs either horizontally or vertically. 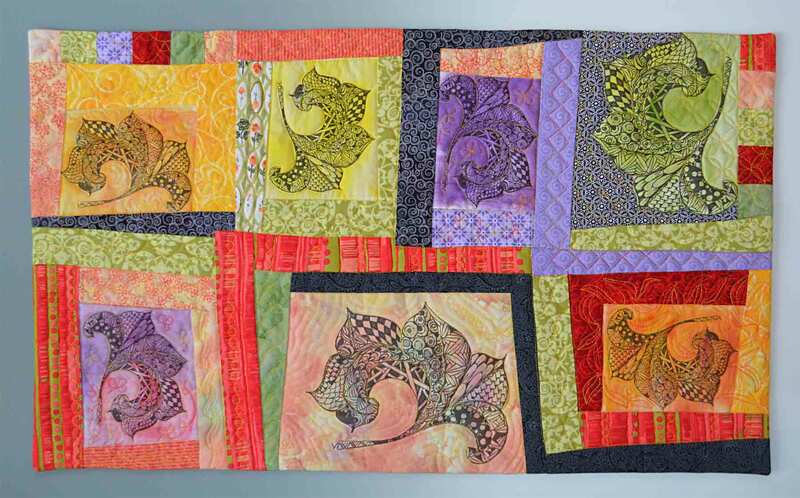 Let’s stop talking about zentangle drawing as therapy, and recognize that it is to quilting as playing scales is to music. A visitor at the 2013 Studio Tour asked me to make more work in colors that would work with her home decorating themes. 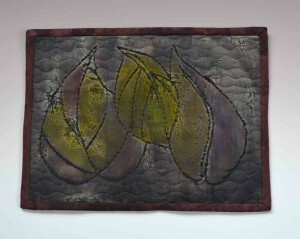 I discovered that most of my silk paintings are quite vivid. For this painting, I toned down the color of the plastic planter to a very rich dark red, which is picked up in the binding. Otherwise, it is all rainy-day colors of green, gray, and white. It is always helpful to listen to our customers! Dennis and I are working together to make at least 40 bowls for the fundraiser on October 9th. 100% of the $20 admission goes to the food pantry at Tri-Lakes Cares. Years ago, when I made pottery bowls, I wondered who needed public assistance in the Monument/Palmer Lake region. Now I know that hunger is among us, no matter where we live. 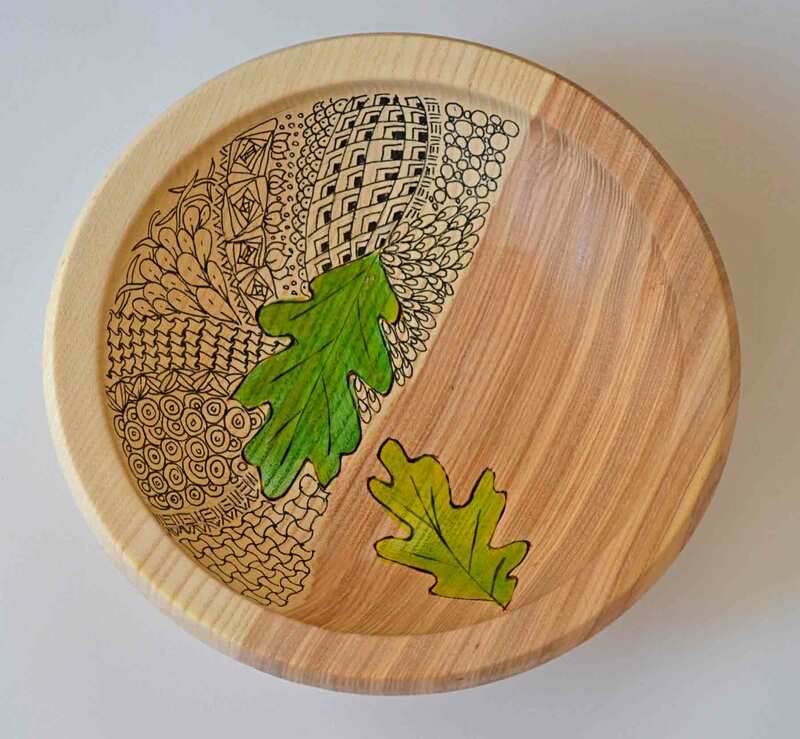 The volunteer doctor for Tri-Lakes Cares, Dr. Bob Gibbs, is our woodturning friend, and he supplies most of the wood used to make the wooden bowls at the event. Dennis often turns the bowls, and I add some decoration. 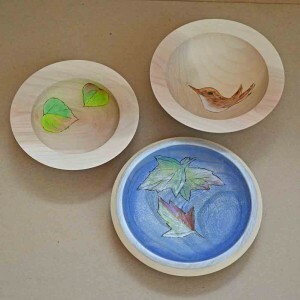 Once in a while, the design is already in the bowl, as with the little bird. A knot forms his eye. Leaves are already perfect in nature. It is difficult to choose an arrangement that doesn’t look natural! 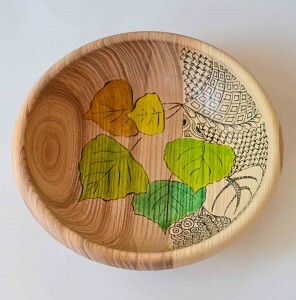 All of the decoration is done with woodburning and acrylic colors. The artwork is sealed with acrylic. 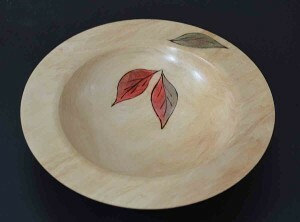 Acidic foods and washing will degrade the color. Although it is non-toxic, the artwork and finish polyurethane will eventually wear off with use. The bowls are not dishwasher safe! Flying above the earth, I see a rumpled quilt of colors, shape, and lines. Throwing a stone in a pond, I create concentric lines around a center point. I take out my hiking map, and find contour lines create a 2D record of shapes. 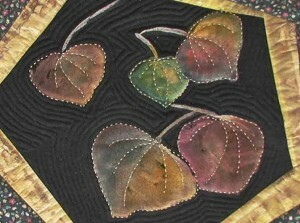 These experiences become useful again when it is time to add lines of quilt stitching. Traditional Hawaiian quilting uses outline stitching around flower and animal motifs. It adds a kind of vibration to the surface. Looking at Google Earth is something like viewing a huge quilt covering the earth. From about 25,000 feet, the Midwest shows that it was divided before it was settled. Sometimes the contour lines cross over the survey lines that divide one field from another. 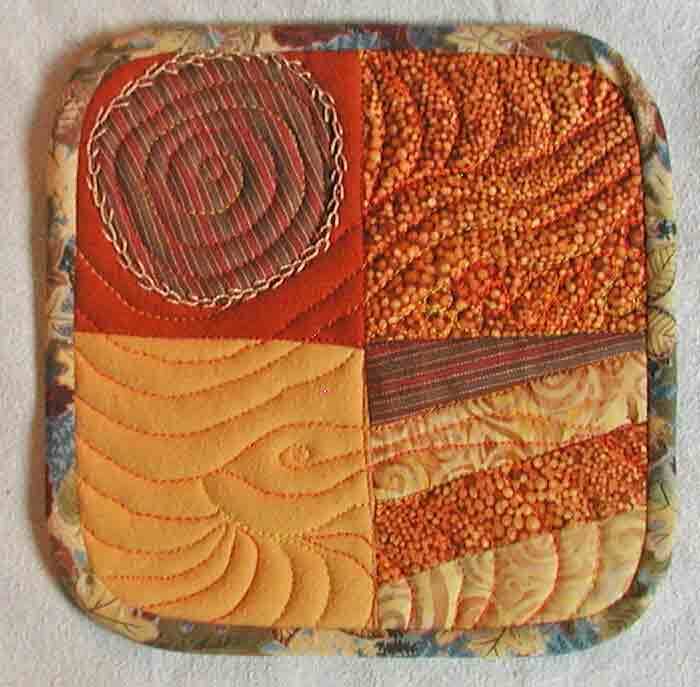 This small quilt is a study of crop circles in Western Kansas. 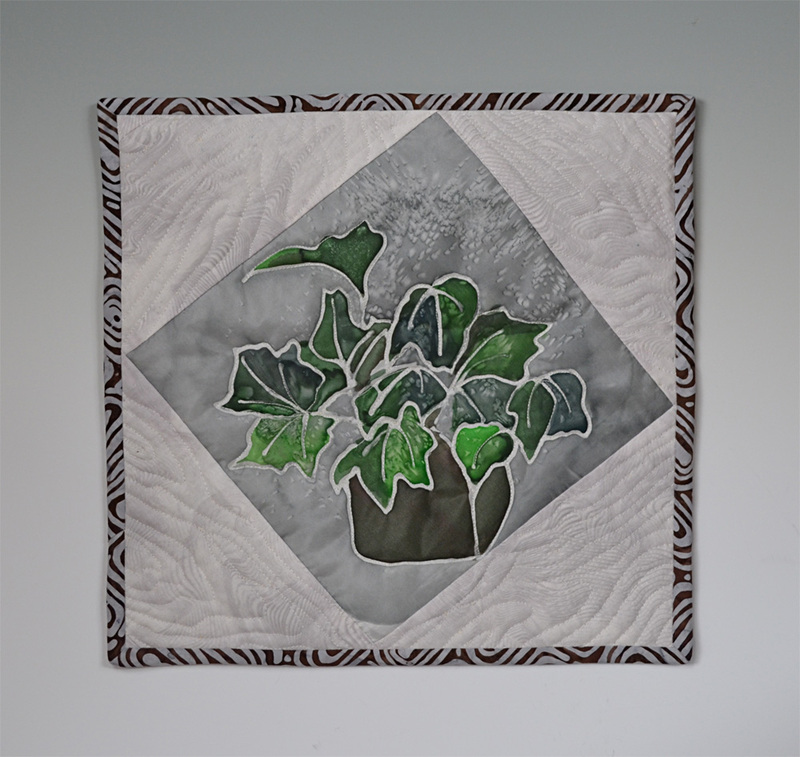 Some of this quilting is on cotton T-shirt fabric, which has a very sculptural quality. 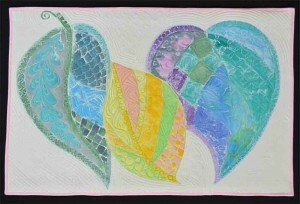 The closely-set quilt lines have become a texture, instead of a drawing.